Inkscape has long been a favorite vector editor in Linux and still becoming the first option for those needing a tool to create vector images. Today, you can use another tool to do so. The tool is Vectr. Vectr is basically an online vector editor, but it also provides a desktop version which is available for Linux, Windows and macOS. The desktop version of Vectr allows you to create vectors. Not as complex as Inkscape, but it is useful enough to create stuffs like marketing tools or diagrams. You can directly export your works to either PNG or JPG. If you want to save the raw file of the vector you are creating, you can save it in SVG. Vectr also supports multiple pages. Both online and desktop version of Vectr can be used for free. If you want to install the desktop version of Vectr on Linux, simply follow the steps below. Copy the package of Vectr, which is available in ZIP, to the “/opt” directory. Unpack the package using your favorite unzipper tool. I use unzip in this case. The extraction process above will result a folder named “linux-unpacked”. To ease your job, you can rename the folder with the shorter name, but there is no problem if you want let it the way it is. Create a new folder in the “/usr/bin” directory and save it as “vectr”. You can add the following lines on that file. Set the “vectr” file to be an executable file by adding the “x” attribute using the chmod command. Up here, Vectr has been installed on your Linux system and you can run it by typing vectron the terminal. However, you won’t see the Vectr launcher on the menu list (or app launcher) of your desktop environment system. To add one, create a new file with the name of “vectr.desktop” in the “/usr/share/applications” directory with the following content. By now, you will see the Vectr launcher on your desktop environment system. The package of Vectr for Linux comes with no icon. That is why you see the gear icon instead of Vectr app icon. If you really need the icon, you can search for the Vectr icon and edit the “vectr.desktop” file above by adding the path of the icon on the “Icon” section (bottom most). Next articleCanva vs Piktochart. Which Design Tool You Should Use? 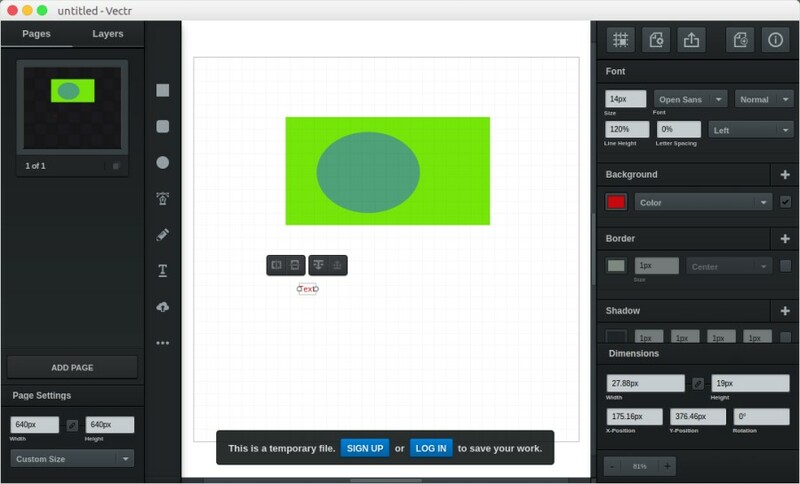 Is Gravit Designer Really a Design Tool for the 21st Century?